Properties in Mount Marlow average 4.5 out of 5 stars. Property 36: Simply Stunning and Unique! DAYDREAMING Airlie Beach Water views & moments to boardwalk. Property 47: DAYDREAMING Airlie Beach Water views & moments to boardwalk. The House of Doc . " A leafy modern 3 bedroom, 2 bath residential house "
Property 49: The House of Doc . " 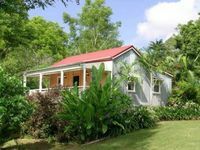 A leafy modern 3 bedroom, 2 bath residential house "
If you appreciate opportunities to experience something different, then the Cane Cutter&rsquo;s Cottage is for you. It&rsquo;s nestled in the privacy of the Pelt&rsquo;s property and its central location makes it easy to explore the Oceanside or inland. The Pelt&rsquo;s are experienced and consummate hosts, ready to assist if required or give you space to enjoy their piece of Queensland paradise.